We have recently been contacted by Jonatan Domènech Arboleda, a student from the School of Industrial and Aeronautic Engineering of Terrassa (part of the Universitat Politècnica de Catalunya, Spain). Jonatan has just completed a remarkable project, a 100% 3D printed Unmanned Aerial Vehicle (UAV) also known as the Barcelona UAV. Keen to share his creation with other 3D printing enthusiasts, Jonatan reached out to us. Looking at the UAV project in more detail quickly made us realize that this project would be worth sharing with our audience. The UAV is not only a nice piece of engineering but also an excellent demonstration of what 3D printers are already capable of today. Jonatan did all his 3D prints on a RepRap using PLA filament. No fancy materials or industrial type 3D printers. 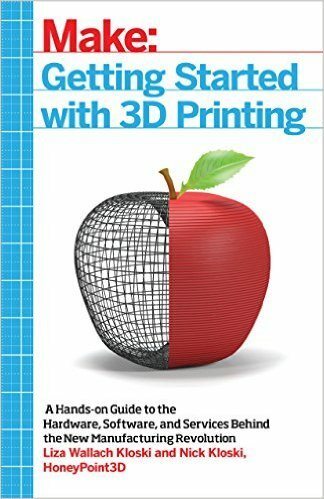 We hope that sharing this 3D printing project will open a few eyes when it comes to the capabilities of 3D printers and maybe inspire a few readers to start similar ambitious projects. 1. 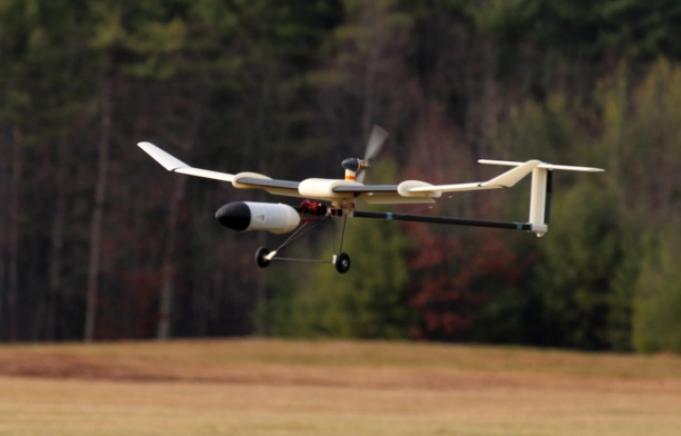 What Led You to Develop the 3D Printed UAV? The idea to develop the 3D printed UAV came originally from Jordi Santacana, the director of CATUAV (a local company specialized in UAV aerial imaging). In the summer of 2013 he participated at a Silicon Valley conference on 3D printing and came back to Barcelona with the idea of adapting this technology for UAV applications. It was the mix of a dedicated student, the University environment and entrepreneurship that made it possible to develop the 1st 100% 3D printed UAV in Barcelona. On a global scale this only the 2nd 3D printed UAV in Europe and the 5th in the world. The study demonstrated the feasibility of using rapid manufacturing technology, more specifically consumer 3D printing, in Unmanned Air Vehicle design. The Barcelona UAV has been designed with Autodesk software, 3D printed with PLA material on a RepRap BCN 3D+. Table 1 shows its final specifications. The Advanced Manufacturing Research Center of the University of Sheffield, and BOEING developed a 3D printed UAV (see Figure 2) that has the 2nd best weight performance, but it is a flying wing glider. Taking into account that the other references have been evaluated including the engine weight, VAST AUAV or SULSA can be considered as having the 2nd best weight performance. The Massachusetts Institute of Technology, Lincoln Laboratory, developed the so-called VAST AUAV in 2013 (see Figure 3). This project was co-sponsored by the US Air Force and RAPID 3D IMAGING. 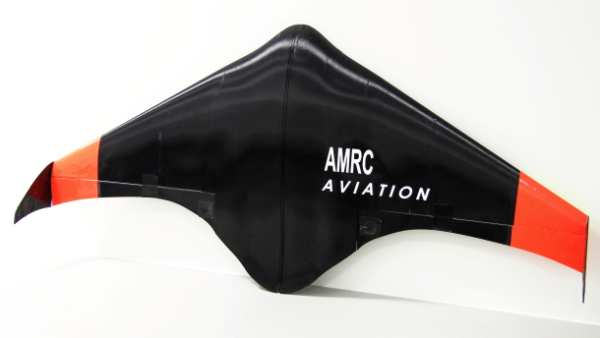 This interesting UAV has a carbon fiber reinforced polymer (CFRP) fuselage beam. It is therefore safe to assume that if VAST was 100% 3D printed, it would be heavier than it is with its current mixed technology design. This leaves the SULSA as having the 2nd best weight performance in the balanced comparison of the weight performance for existing 100% 3D printed UAVs. SULSA was developed by the University of Southampton, a UAV that is the 1st 3D printed plane and the 2nd best weight performance in the world. SULSA, with 6.174,68 € budget, has been sponsored by a UK-based 3D-printing firm, 3T RPD2. The Barcelona UAV has only 28% of SULSA’s weight and taking into account the wingspan, it is 37% of SULSA’s weight/wingspan ratio which underlines the amazing result of this project. In order to compare the Barcelona UAV with the MULTIPLEX Easy Star II (an entry level model airplane), it is necessary to compare the ratio of the weight / total span (wing + fuselage) because of the similar sizes, see Table 3. The Barcelona 3D printed UAV has the same weight performance than injection technology of high density foam, ELAPRON®. Since this evaluation has balanced the alternatives, the fuselage, wing and tail cost have been compared in order to tiebreaker them. The Multiplex Easy Star II costs 78.90€, including taxes but excluding avionics. The Barcelona UAV costs 18.63€, including taxes and energy cost but excluding the RepRap BCN 3D+ printer cost. Taking into account that RepRap has a 3D printing service in the Barcelona UPC Campus with a cost of 0.12 €/cm3, the cost of producing the Barcelona UAV is 44.71€, including taxes. 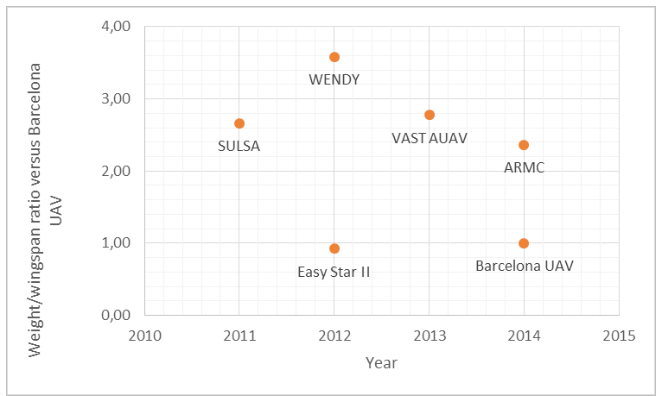 Therefore the Barcelona UAV cost is only 57% that of the Easy Star II. This is an amazing result of this project because it demonstrates the feasibility of 3D printing technology in UAV applications. This document has demonstrates that the 3D printing service of the Barcelona UPC Campus is the best option for 7 or less units and in case of more than 7 units of the 3D printed UAV the best option is to buy your own low cost 3D printer. 2. How Did You Design the UAV? Did You Have to Learn Any New 3D Modeling Skills? 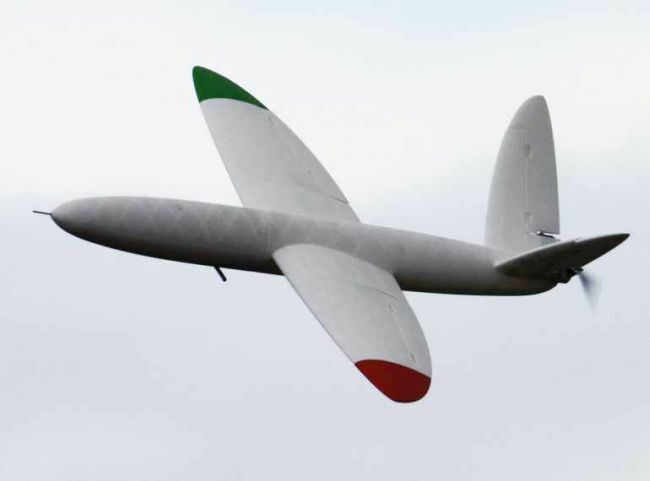 The Barcelona 3D printed UAV has been designed using Autodesk software, with a student license. You need such a powerful software in order to fully apply your knowledge. Having a clear target also greatly helps to sharpen your 3D modeling skills. For this project the target has always been to design a new UAV design, in view of manufacturing it using 3D printing technology. Over time, I tested various CAD software. Today, I find AUTOCAD, INVENTOR and 3DS MAX to be useful design tools, since each has a great community of users that you can learn from to further develop your own skills. Aircraft design, in order to design the UAV. C++ programming, in order to optimize firmware configuration and G-Code parameters to obtain the high performance required for this specific application. Statistics, in order to analyze the results of the printing in function of the configured parameters. More precisely, the weight in function of the Z axis height and printing speed. Fluid mechanics, in order to analyze the deposition behavior of the fused material from the 3D printing process and to design cooling requirements for PLA parts in contact with the engine. Materials science, in order to compute structural requirements for the used materials and sizing the design. Flight mechanics, in order to compute the operational requirements for the remote control of the UAV. DIY skills, in order to join parts and assembly the UAV. 3. What 3D Printer and what Material Did You Use to Print the Parts of the UAV? All parts of the UAV were saved as .stl files and then sliced using slic3r. The wing has a rectilinear infill of near 0.3%. and only one perimeter. Both fuselage and tail have 0% infill. 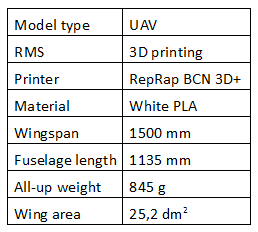 Compared to the overall size of the UAV, the build volume of the RepRap BCN 3D+ is relatively small. Therefore, wings and fuselage had to be printed in sections that were then assembled to form the full size UAV. I experimented with various joining or welding techniques and ended up using a heat welding process. Using a standard soldering iron and left-over PLA material, I was able to join the different sections. As it turns out, the molten PLA distributed evenly into the joints, giving the bond a very high tensile strength. In my opinion, materials research will contribute to the most important developments in 3D printing over the coming years. Materials with different flexibility, mechanical properties, color and recyclability will be soon available for 3D printing users. With the proliferation of dual extruder 3D printers, material flexibility will constitute an important development since this will allow for the creation of anisotropic parts. The possibility of 3D printing a blade using root flexibility for the first material and tip flexibility for the second and a controlled mix of them along the longitudinal axis, will become an improvement for fluid mechanic engineering. Mechanical properties of the material can be modified by adding CF nanotubes or similar reinforcements. Nowadays there are already ABS materials with high mechanical properties. The minimum perimeter thickness, near 500 μm, and the maximum part size of 3D printing technology are still the main limitations. Therefore improving the Young modulus or stiffness of 3D printing materials will lead to new applications. Color of the filament is an interesting feature for 3D printers with multi extruders because RGB or CYMK basic colors can be mixed to generate any color tone. This feature will increase 3D printing applications. To my mind, recyclability is the most important performance for 3D printing technology for the simple reason that it allows users to have a lower cost rapid manufacturing tool. When prototyping you always generate waste and unused parts. Having the possibility to recycle this waste material would be desirable both from a cost and environmental point of view. For the Barcelona UAV I used PLA, a biodegradable material. I believe this is essential for any applications where parts may go lost outside. Still, even with PLA you have to careful since its biodegradability also depends on the properties of the additives used in manufacturing the filament. 4. Could You Have Developed the UAV Without 3D Printing? No, this would not have been feasible with standard technologies since many of the UAV parts constitute complex shapes that would either have been too costly or even impossible to mold. 5. What Did You Learn About 3D Printing by Working Through This Project? 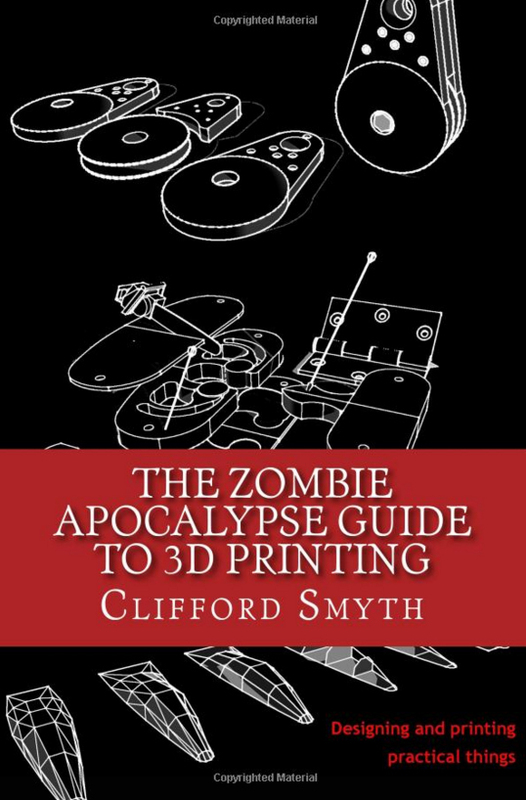 3D printing constitutes the 3rd Industrial revolution. In the future, consumers will buy .stl files via the internet and print their objects at home or via a 3D printing service. This will affect traditional industries, supply chains, distribution and employment in totally new ways. Therefore, 3D printing technology must be analyzed and understood from a global and not only a local point of view. Compared to other rapid manufacturing systems, 3D printing technology is a low cost way of transferring things from the world of the ideas to the real one. Therefore, 3D printer device selection played an important role in my project. The main requirements were cost, multi material availability, double extrusion capability, open-source philosophy and supplier proximity. The aforementioned performance requirements allow a designer to create something economically feasible, while using new materials and mixing different material properties to customize parts to very specific requirements. Firmware configuration is also important in order to improve the technology for a given specific application. In order to test a new system’s power and limitations you always need a bit of respect and a will to test things out. Respect is required since the 3D printer is not a toy and it constitutes an important device in the design cycle. Testing is required since this is the only way to completely understand the full depth of the technology that you have at your finger tips. The project also made me understand the direct relationship between time, weight and cost. 3D printing is the only technology where investing time in weight reduction has a direct impact on cost reduction and manufacturing time reduction. Traditional technologies increase cost in function of the weight and manufacturing time reduction. Last but not least, I learned a ton about joining 3D printed parts as this played an important role in assembling the UAV prototypes. As build volumes of 3D printers are still relatively small, the UAV had to be printed in sections which were then joined. 6. Based on What You Know About 3D Printing Now, Where Do You See the Biggest Limitations and Greatest Opportunities? The biggest limitation is the PLA material because of its stiffness, mechanical properties and its density. New PLA materials with specific properties must be developed while maintaining the biodegradability. The biggest opportunity I see is that a design can be digitally distributed and 3D printed anywhere in the world thereby giving you access to a worldwide network of beta testers. Anyone with a 3D printer and 0.5 kg of PLA can manufacture their own homemade UAV. 7. What’s Next for the 3D Printed UAV? The use of conductive materials. Using a 3D printer with a dual extruder, one could imagine printing the UAV wings and fuselage of one material while using conductive material to print the wiring required for the avionics. Anisotropic parts, because propeller blades or wings could be designed with specific flexing behavior according to aerodynamic optimization. Specific Infill for lightweight parts, because the existing patterns are only focused on support material and mechanical properties. This study has designed a lattice 3D honeycomb interesting for this development. An advanced joining system, because the UAV requires parts joining and heat welding is a simple technology. This new system must be a heat technology able to be configured by temperature adjustment and surface selection, inside or outside the slices. I am currently finishing my studies and while I have no concrete plans for the future of the 3D printed UAV yet, I sure think about it. By the way, upon graduation I’ll be looking for a nice job! Do you have any questions or feedback about the 3D printed UAV project? If so, please let us know by leaving a comment below. In case you have your own 3D printing project that you would like to be featured here on the blog, don’t hesitate to get in touch!